New Delhi: Department of Agriculture and Allied Departments, Govt. 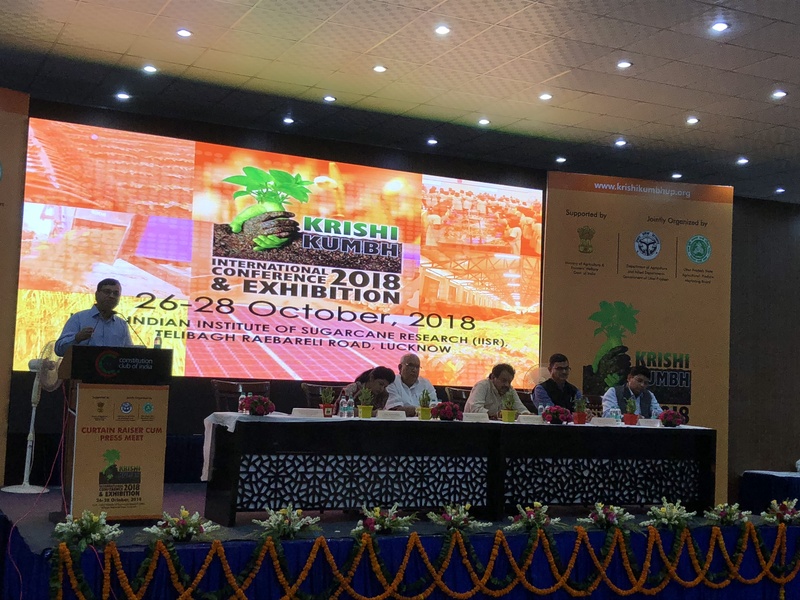 of Uttar Pradesh in association with Uttar Pradesh State Agriculture Produce Marketing Board has organised a curtain raiser event for Krishi Kumbh 2018 in the capital city, New Delhi. The event was inaugurated by Surya Pratap Shahi, Minister of Agriculture, Govt. of U.P, who presided the event as its Chief of Guest. Apart from him, S.P Singh Baghel, Minister of Animal Husbandry, Govt. of U.P, and Swati Singh, Minister of State (IC) Agriculture Marketing also addressed the audience and share insightful details about the upcoming event. Keeping in view the vast potential available in agriculture and allied areas and to double income of farmers, the UP govt. is organizing three days Krishi Kumbh from 26 to 28 October 2018 at Indian Institute of Sugarcane Research, Telibagh Lucknow. In this program farmers from all the 75 districts of the state and from other states,National & International agriculture scientists and representatives from industries & policy maker from Central and State government participated. The primary objective of Krishi Kumbh 2018 is to provide a common platform to farmers, farmers group, technical experts and entrepreneurs for seamless exchange of knowledge regarding agriculture production food processing and marketing, agriculture mechanization, agro food processing, high value crops, input and technology management in agriculture, PHT, e-NAM, ICT and innovative models in extension, animal husbandries, horticulture, poultry, fishery and many more. Furthermore, the event aims at increasing the agriculture production by adopting advance technologies and emphasis on sustainable and durable production technology. The event will also develop integrated communication system involving different stake holders at village/district/state/national /international level. The event is also expected to economically empower agriculture and allied sector and generate employment. Krishi Kumbh 2018 will enable the farmer to have latest improved technology and various technical sessions will be organized with scientist from international/national research institutes and agricultural universities. Under e-NAM scheme 100 mandies have been linked to e- NAM. Till date 28 lac farmers and 32000 traders have been registered and produce of 192 lac qtl. worth rs. 2794 crore have been traded. The curtain raiser event also showcased the new technologies by the technological experts for the agriculture sector, announcements by the govt. for the sector and other important information related with the Krishi Kumbh 2018.